[Episcopal News Service – Los Angeles] California Episcopalians — still reeling from the deadliest wildfires in the state’s history — say they are gathering strength and resilience through community connections and an outpouring of love and concern from across the Episcopal Church. The Rev. Ann Sullivan’s northern California home was destroyed in the Camp Fire, but on Nov. 14, she was making plans to retrieve computers and sacred items from the relatively untouched St. Nicholas’ Church in Paradise. “The parish administrator and I will have office space at St. John’s Church in Chico” as recovery efforts continue, Sullivan told Episcopal News Service in a telephone interview. She was also trying to connect displaced parishioners with St. John’s members who had opened their homes to fire victims. “Everyone I know who lived in Paradise lost their home,” Sullivan said. The Camp Fire, which began Nov. 8, is considered the deadliest blaze in California history, killing more than 60 people and destroying more than 130,000 acres of land and 7,600 dwellings. At least 600 people are missing, and the death toll is expected to rise. Meanwhile, St. John’s, some 14 miles away in Chico, has become a hub for recovery activity and is ready to shelter the displaced, if necessary, according to the Rev. Richard Yale, rector. Yale said he was amazed that St. Nicholas’ Church in Paradise sustained only superficial damage. “It was right there, in the heart of what was burning, and it’s still here.” As for the rest of the city of 26,000: “Paradise is gone. There’s no infrastructure left,” Yale said. Similarly, in Southern California, more than a dozen church members and preschool families lost their Malibu area homes in the Woolsey and Hill fires, but St. Aidan’s Church was untouched, according to the Rev. Joyce Stickney, rector. The fires broke out Nov. 7 and have consumed an estimated 97,620 acres in Los Angeles and Ventura counties, roughly the size of the city of Denver. More than 435 structures have been destroyed and a third body was discovered Wednesday, Nov. 14, as gusting Santa Ana winds continued to hamper firefighters’ efforts to fight the blaze. Yet Stickney planned a Nov. 14 community meal and evening prayer service at the Church of the Epiphany in Oak Park “for anyone who wants to come, and to begin assessing what are their needs and what kind of services people can start providing right away,” she said. In Oak Park, flames charred landscaping and vegetation around Epiphany Church, located on Churchwood Drive where several homes did not survive the blaze. Neither church buildings nor the congregation’s vineyard suffered damage, according to the Rev. Greg Brown, vicar. The Very Rev. 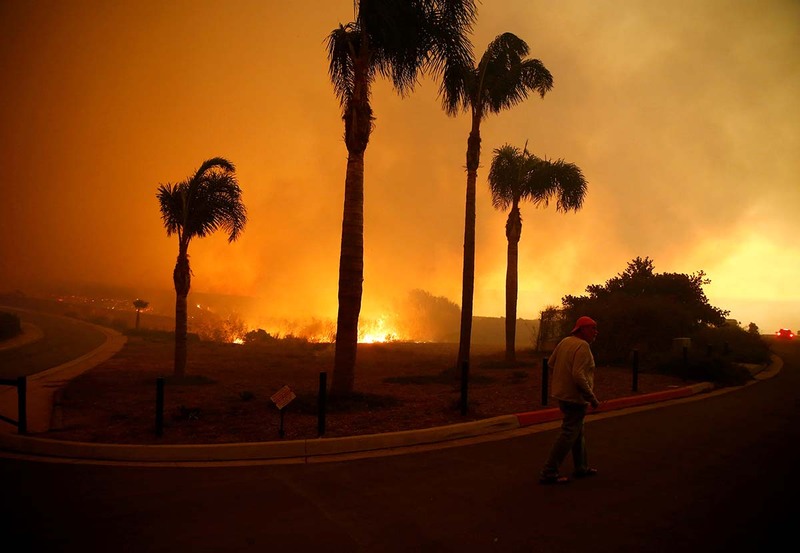 Michael Bamberger, rector of Ascension Church in Sierra Madre and chair of the Los Angeles diocesan disaster relief task force, said he was making a presentation in the Diocese of Northern California when the Camp Fire erupted. Bamberger, a member of the Episcopal Relief & Development Partners in Response and Resilience team, said the agency is partnering with both dioceses to coordinate with local congregations to provide emergency support. In Northern California, a disaster relief team at St. John’s, Chico, is already distributing emergency supplies such as gas, clothing, food and other basic needs. In Los Angeles, daily coordination calls with bishops, local clergy and key diocesan disaster leaders are underway, he said. The diocese is also paying close attention to pastoral needs and the impact to vulnerable communities. “Assessment is ongoing as the fires are not full contained yet,” said Lura Steele, program officer for the U.S. Disaster Program at Episcopal Relief & Development, in a statement on the agency’s website. “We will continue to work with our local partners to respond to the needs of those affected,” she said. Local clergy said the support and outpouring of love has been overwhelming and heartwarming. In addition to ongoing diocesan support, Yale said they had heard from congregations around “our diocese, neighboring dioceses, from across the country.” Even St. Paul’s Church in Poughkeepsie, New York, reached out to them. “A member there had received wonderful pastoral care in a family crisis here 25 years ago. … She mobilized her church to raise funds,” he said. Stickney also felt overwhelmed by the outpouring of love and support. People are “still in a state of shock. The outpouring of services, support, resources has been so moving, and that in itself is healing,” she said. The grim reality of the fires has underscored the importance of family and community, added Sullivan and Stickney. “At least we got out safely,” said Sullivan, who evacuated early with her three children. To donate to the Episcopal Diocese of Northern California disaster relief, please click here. In Los Angeles, donations to the diocesan Fire and Mudslide Relief Fund may be made online here. Priority is placed on disbursement of aid to the region’s low-income and otherwise most vulnerable who might not otherwise receive relief amid the disaster.